Lumber company scrip issued by Knapp, Stout and Co., Barron County, Wisconsin, between about 1878-1890. 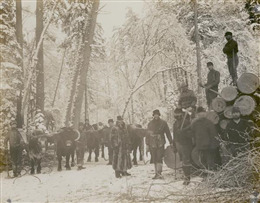 In the forests of northern Wisconsin, ready cash was frequently hard to come by in the nineteenth century. This was especially true in lumber camps, where workers were often paid in company-issued scrip rather than United States currency. Scrip is a substitute for government-provided legal tender, which is issued by a private business, organization, or local government. 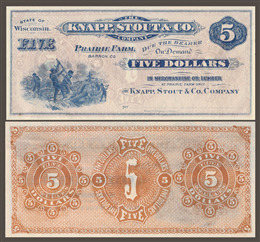 The scrip featured here is an uncut sheet printed for the Knapp, Stout and Co. lumber company between about 1878 and 1890. The sheet contains $1, $2 and $5 bills as well as smaller bills in 5, 10, 25 and 50 cents amounts. The bills are printed in blue ink on the face and reddish-brown on back and are marked "due to the bearer on demand [face amount] in merchandise or lumber at Prairie Farm only." Specifically exempted from the Wisconsin state statute requiring employers to pay wages weekly or bi-weekly in cash, lumber companies frequently paid their workers in scrip redeemable at the company store. 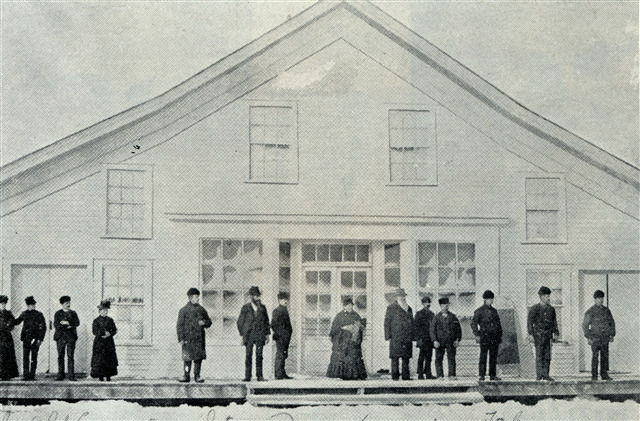 Company-run stores served not just as a convenience for men often working miles away from the nearest settlement, but also allowed employers to recapture some of their labor expenses. In some cases, employers included contract provisions requiring workers to patronize their stores. Workers wishing to convert their scrip to cash generally had to do so at a discount. These examples of scrip were redeemable in lumber as well as merchandise. 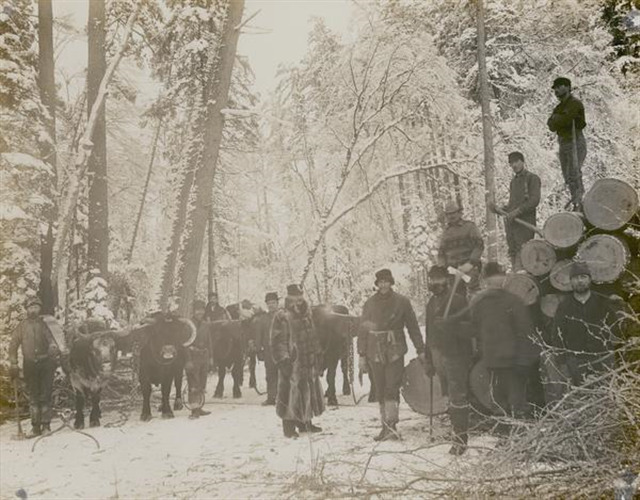 Such an option may have appealed to new settlers in the region, who worked in the lumber camps in winter to earn enough money to establish a farm. Taking their wages in lumber may have helped them build a much-needed house or barn. Knapp, Stout and Co. was founded in 1846 when Iowa lumber dealers William Wilson and John H. Knapp bought a saw mill on the Red Cedar River at Menomonie, Wisconsin. The company took its familiar name in 1853, when Henry L. Stout joined the partnership. Knapp, Stout and Co. grew into the largest lumber company in the world by the 1870s. In addition to 115,000 acres of Wisconsin timberland, the company owned lumber camps, dams, saw and grist mills, foundries, blacksmith and machine shops and operated a fleet of steamboats to steer its lumber to its sales yards along the Mississippi River as far south as St. Louis, Missouri. 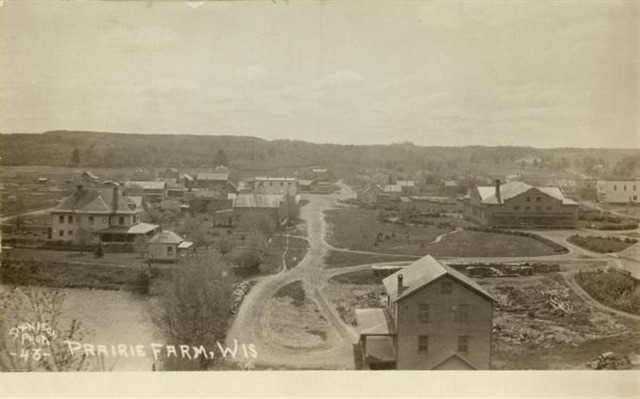 It also owned six large farms in Dunn and Barron counties, where it grew food for its crews and maintained huge herds of livestock for meat and traction power. From the 1870s through the mid-1890s, Knapp, Stout and Co. sent an average of 85 million board feet of lumber to market annually. The size and influence of the company was such that on May 28, 1888, The New York Times urged Congress to investigate the creation of a Midwestern lumber trust. "It does not seem possible that the plan can fail, now that the Knapp, Stout and Co. Company, the greatest lumber manufacturing corporation in the world, seems to be ready to be absorbed into the combination," the newspaper wrote. 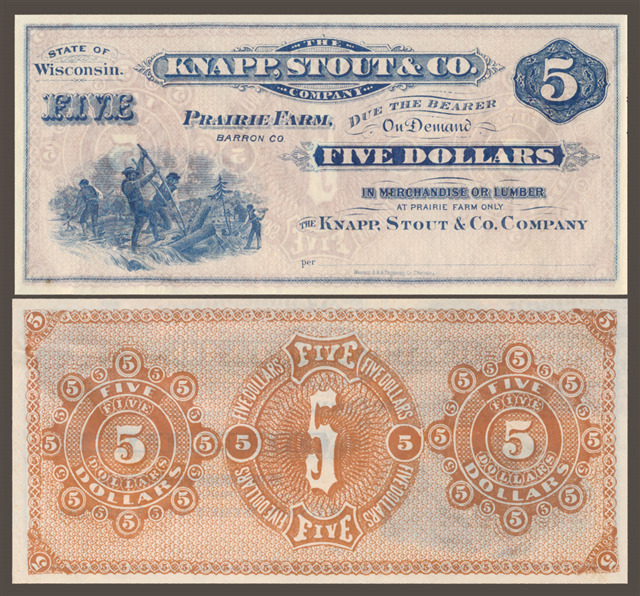 As the company grew, Knapp, Stout and Co. issued scrip in at least three separate locations: Menomonie, Rice Lake, and Prairie Farm. Prairie Farm is the oldest European settlement in Barron County, established by Knapp, Stout and Co. in 1848. As the company's Wisconsin lumbering operations expanded north from its Menomonie headquarters, the company sought a new location with sufficient prairie to pasture its large holdings of livestock, as well as water power for the establishment of a mill. The company found what it wanted at the foot of the bluffs overlooking the Hay River about 25 miles north of Menomonie. The company began logging the site in 1848 and established a 600 acre farm there in 1856. Seven years later, it dammed the Hay to build a saw mill, and it added a company store in 1866. These specimens of scrip were printed by the Western Bank Note and Engraving Co. of Chicago. 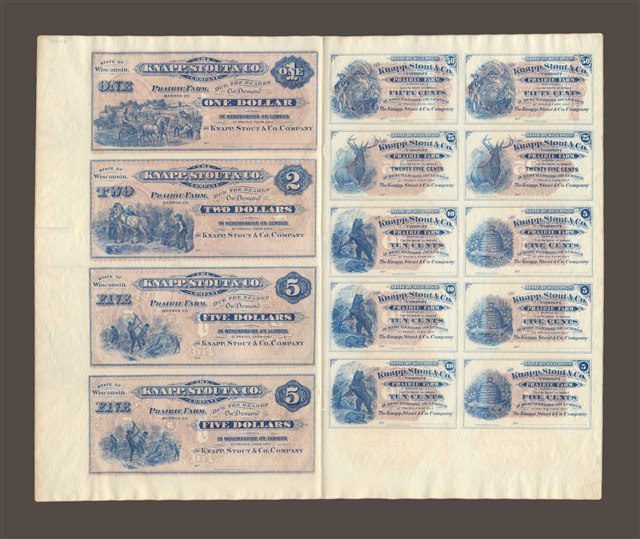 Western Bank Note, established in 1865, was a "security engraving" company specializing in bank notes, stock certificates and other documents of monetary value which needed to be protected from forgery. As printing - and copying - technology improved in the mid nineteenth century, security engravers developed several techniques to thwart forgers, all of which are seen on these bills. 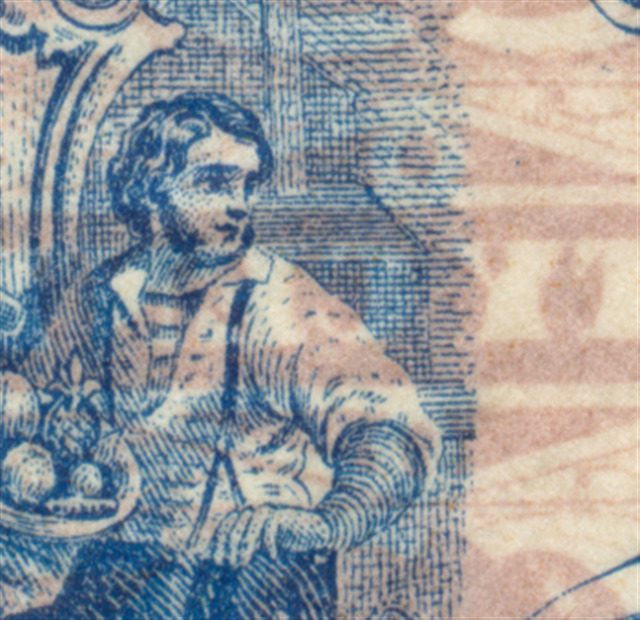 They printed on the back as well as front of notes, and added a second, and in some cases, a third color of ink. In addition, the engravings on the notes were made increasingly larger and more detailed, often with complex and precise decorative filigree added. Difficult to duplicate, these often exquisite images also presented a vision of economic progress and promoted confidence in the issuing financial institution. Having invested in creating the images, security engravers often sold the same ones to many different clients. Surprisingly, only one of the notes shown here depicts actual lumbering. Indeed, lumbering barely outlasted the nineteenth century in Barron County. 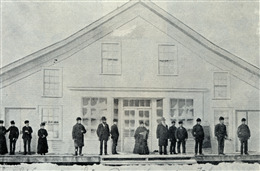 Knapp, Stout and Co. sold its company store at Prairie Farm in 1891, and by 1901 had ceased its logging operations there entirely.